While other antiquated office practices – faxing, sending documents by post, filing paper and smoking in the office – have become pretty much extinct, somehow the use of Excel spreadsheets in the resource planning world is still going strong. Bizarrely, in the digital age, many managers are attempting to do the important job of allocating their teams, equipment, and facilities using Excel, along with a haphazard combination of emails, wall charts, whiteboards, and notebooks. Either they are unaware that specialized resource planning tools exist, or they have a misconception that they are expensive, complex and hard to use. However, as Ganttic customers know, the benefits of using software that’s developed purely for resource planning and project portfolio management, are huge. 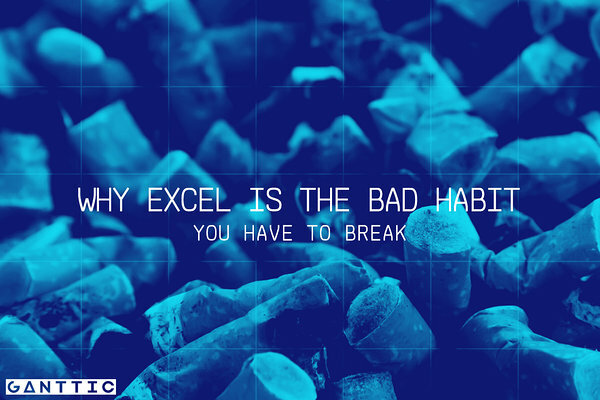 Once you break the Excel habit, you will never want to go back. Don’t get us wrong, we love Excel spreadsheets and they have many powerful and useful applications in business. But, in the resource planning and project portfolio management domain, they are no substitute for purpose-built solutions. With no transparent, flexible way to collaborate, it’s impossible to stay on top of issues that can impact the efficient delivery of your projects. In addition, a host of common frustrations includes face-palm inducing crashes of unsaved spreadsheets; mind-numbing cell-merging when the plan changes; and the chaos that ensues when a spreadsheet is emailed back and forth for edits and no-one is clear on which is the latest, bang-up-to-date version. Using spreadsheets for resource planning can be laborious. Manually creating settings, duplicating data and calculating resource utilization is time-sapping. And, when plans change, it involves multiple steps to make space for new tasks cells. The simple fact is that spreadsheets are not designed for team use. When several people work on the same file simultaneously, they have no idea what additions are being made by others. This can result in conflicting modifications that have to be resolved. Using spreadsheets to record how and when tasks are being completed creates a time-lag in communication. Without having a clear and current view of utilization, it becomes difficult to identify those working too hard and to optimize workload accordingly. This impacts employee health and wellbeing – and their ability to meet deadlines. If your plans and schedules are documented in spreadsheets, sharing is carried out manually, usually by e-mail. The recipient can only access the file if they are using a computer with compatible spreadsheet software. Depending on the spreadsheet software you use, you will likely have the choice to export to multiple formats. But spreadsheets lack the feature for exporting selected fields, they can only export an entire sheet or document at a time. Spreadsheets can usually be opened by anyone who has the file and compatible software. While it is possible to activate password protection, this system is still vulnerable to data loss or theft of local machines. There are usually license fees to use spreadsheet software, which could cost up to €350 for each computer. On top of that, updates and maintenance can drive prices up. Can Ganttic solve these issues? Ganttic resource planning software is designed specifically to answer the needs of resource planners and project portfolio managers – answering their dreams for a web-based, real-time planning tool, ideally placed to help teams collaborate and work smarter. If you’re stuck in a spreadsheet nightmare, a free trial of Ganttic may be the wake-up call you need. You will discover a range of one-click utilities that spreadsheets can’t offer – including click-drag-release planning, milestones, and dependencies for tasks, automatic utilization calculation, custom data fields, color schemes, resource grouping, and filtering. Designed to make teamwork run smoothly and efficiently, Ganttic allows multiple people to work on a plan at the same time without duplication. It’s easy to add unlimited users and personalize permissions for reading, viewing or editing plans. Task, project and resource history can be tracked down to the second, making it easy to see how a plan has evolved. Take a tour here to discover more features and benefits. Why not give it a try? It's free, no strings attached. Ganttic VS a Free Resource Planning Spreadsheet Template? It is common knowledge that teamwork is the backbone of any organization and every team has to find the tools that suit namely them. But what about resource management software?